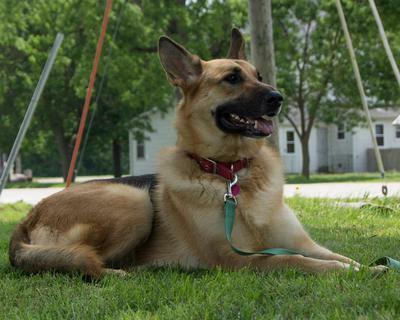 Annie Oakley is a 2 year old Shepherd who joined our family a couple weeks ago. She is still working on finding her place in our family. Her and Bear are getting along very well so far. They both are ruled by the cats, allowing them to eat first and drink out of their bowls. It's rather comical. What a great story. 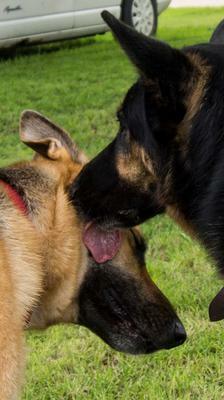 The pictures of your two German Shepherds are just lovely too! I am so excited for you adding Annie Oakley to your pack. What great names for your dogs - but Annie Oakley is a new one for me - funny that you named her that - I was really interested in her story when I was a kid. Such an accomplished woman. But I digress, I am sure your new addition, Annie, will be just as popular around your home once she gets established. Good luck with the transition - it takes time - but once it's over you'll wonder how you ever got along without her. Please send us more pictures and an update in the future on how they are all doing - even the cats! 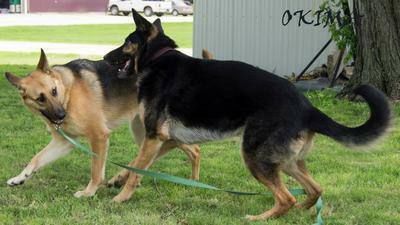 What two Gorgeous German Shepherds you have! You welcomed a new member to your family, Anni that is Great and Bear will a companion other than the cats. Bear and Annie look like they have bonded and probably will be inseparable. Annie looks a lot like my Mia who is 3. German Shepherds are so amazing and your family has 2. Take care of them both Bear and Annie and they will always take care of you and your family, even the cats!